Avengers: Infinity War is the biggest movie of the year, there’s no doubt about that. While that may be the case, we’ve seen very little thus far on what’s being dubbed the biggest blockbuster of all-time. With the film now releasing at the end of next month rather than May, seeing only a trailer and short TV spot is quite surprising, but also a good thing. This movie isn’t like Black Panther or even Thor: Ragnarok of last year, there aren’t many new characters other than the mysterious Black Order in this movie, meaning that new footage doesn’t need to be debuted. Sure, we’re all losing our minds to see the Guardians meet the Avengers and this character meet this character, but Marvel and company are doing the best thing possible by keeping everything behind closed doors for the fans. Now, we can all experience those absolutely nerdy moments for the first time while we sit down to watch it in just over a month. Luckily though, they aren’t slowing all things down, as a new image has dropped for the massive movie. Thanks to Total Film, we have a badass new look at one of the more geeky moments in the trailer. 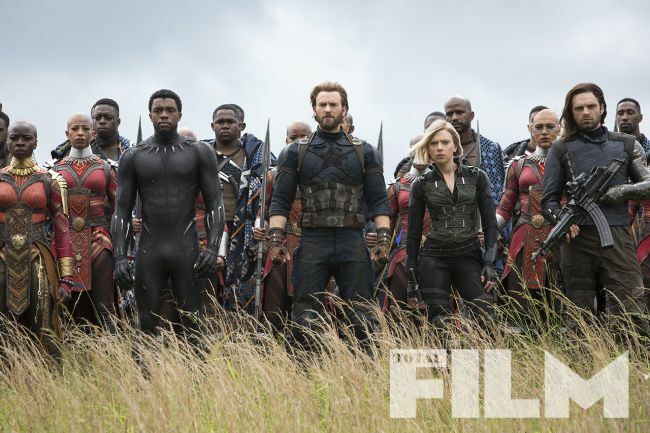 As you can see, Captain America is joined by Black Widow, Black Panther and Bucky on the open land of Wakanda as they prepare to take on whatever forces Thanos is bringing to one of the core locations of the film. This is absolutely epic. Yes, we’ve seen a small shot of this image, but this shows something completely different in the realm of ranks and giving orders. As Total Film’s emphasizes, this is Cap’s new team after the events of Civil War. But as I’ve seen many asking, why is it Cap’s? Why isn’t T’Challa leading since it’s in Wakanda? First of all, this is just an image and he very well could be. But for myself, after seeing the truth behind the lies in Civil War and how T’Challa took in a wanted Steve Rogers, it’s my belief that T’Challa just flat out knows that when it comes to teams and world critical fights, Cap is the man to follow. That epic final shot in the trailer is the prime example, as Cap is leading the charge with Widow, Panther and Bucky right by his side. This Wakanda battle is going to take epic to an entire new level, as will the film. There’s not much to ask other than which character team-up are you looking forward to seeing? Directed by Joe and Anthony Russo and starring a massive cast, Avengers: Infinity War now opens on April 27th. EW Reveals 15 Incredible ‘Avengers: Infinity War’ Covers!